Some deaths, depending on the situation, can be quite messy. After emergency personnel and law enforcement leave, and the scene is released, you might be left with a significant cleanup. There may be blood, human waste or other bodily fluids present at the scene that can be hazardous to human health. If you find yourself responsible for cleanup following a death of a family or loved one, please proceed with caution. To avoid possible exposure to dangerous bacteria, viruses and bloodborne pathogens, you should consider contacting a biohazard cleanup company in your NJ area. Cleanup on your own can be emotionally stressful and physically challenging, let the professionals help. Weather it is a natural death, homicide, suicide or accident, the scene of the death can potentially be contaminated with various biohazards like blood and bodily fluids. Bio contaminates like blood and other bodily fluid, should be handled with caution because there may be various bacteria, virus and other bloodborne pathogens present that can be dangerous to those exposed. Due to the sensitive nature of such contaminants, professional biohazard remediation is often recommended. Blood Spill– Depending on the nature of the death, there could be a great deal of blood splatter and blood spill throughout the scene and possibly other areas of the New Jersey property. Blood is considered a biohazard that may contain various dangerous bacteria and bloodborne pathogens. Blood often needs to be cleaned up by specially trained blood cleanup technicians in New Jersey. In order to restore a safe environment, some contaminated materials may need to be disposed of in accordance to specific disposal protocols. Postmortem Defecation– Following death, before a body tightens into rigor mortis, the all of the body’s muscles relax and anything that the deceased may or may not have been “holding in” will inevitably fall out– feces, urine, bodily fluids and gas. Human feces, urine and other bodily fluids can carry a variety of dangerous bacteria that can be harmful to people. The scene of the death might be contaminated with feces, urine and bodily fluid the require specialized cleanup, disinfection and sanitation. Decomposition– Decomposition begins rapidly following death. How soon the body is discovered and the conditions of the surrounding environment will control the level of decomposition. Bodily secretions, noxious odors and insect infestations from decomposition makes cleanup difficult and possibly dangerous. Bodily secretions can carry hazardous bacteria and need to be cleaned following specific cleaning procedures and safety protocols. Gases released from a decomposing body will leave behind a foul odor that will be difficult to eliminate. Professional death cleanup companies in South Jersey have the necessary technical training, equipment, cleaning agents and personal protection to safely and effectively clean, disinfect and sanitize the contaminated space. Technicians will also eliminate all foul odors from the effected space. It is important to keep in mind that cleaning up after a death is not only dangerous, but can be rather overwhelming. Health hazards aside, coping with death is difficult in of its own. Cleaning up after a death on top mourning can be emotionally taxing and physically exhausting. Professional biohazard cleanup technicians are trained to take that burden off your shoulders and safely restore the property back to its pre-incident condition. When a death in a New Jersey property leaves behind blood, human waste and possibly other bodily fluids, DIY cleanup can be hazardous and ineffective. Blood, feces, urine and other bodily fluids can carry dangerous bacteria and put your health at risk. In addition to the risk of exposure, it can be difficult to achieve and effective cleanup on your own. Once blood and other bodily fluids have soaked into the porous materials like carpeting or furniture, cleaning is often ineffective. Certain contents and building materials may be non-salvageable and will require proper removal and disposal. Some areas of contamination may be difficult to see or access and will likely be overlooked by the untrained eye. 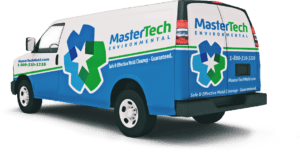 If you are in need of human or animal waste and bodily fluid cleanup services in South Jersey, contact Mastertech Environmental’s New Jersey death and crime scene cleanup team today. Call us at 1-800-310-3226 to speak with member of our team.